It has been very, very rainy around here as of late. Rainy days are nice though because they can get you to do some projects that you have been meaning to do for a while. 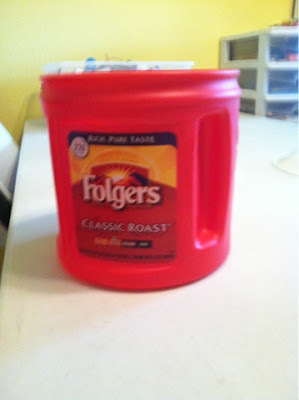 I have been thinking that these ole coffee cans that we use for our compost buckets could use a little sprucing up. My kids love to paint and sometimes Moma *cough, ahem* doesn't love getting out messy paint. 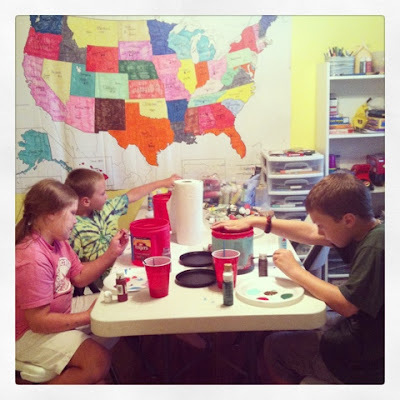 I got over my being afraid of the mess and let the kids go for it. 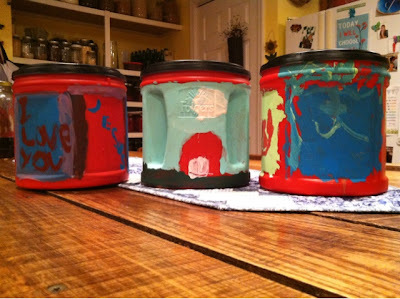 The cans were fun to paint, not necessarily easy though. They ended up just working on covering over the labels. We don't have very good paint brushes right now either. That is on the list to be replaced with the new coming school year. It was a fun rainy day project and our scrap buckets look a lot happier than they did prior to painting.